Explore the Kennebec River where shipbuilding began more than 400 years ago and continues today. Cruising past BIW see spectacular views of the Navy’s most advanced ships taking shape. 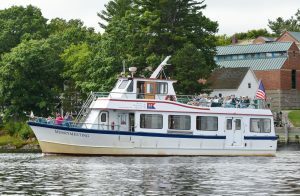 Then cruise down river to enjoy a water view of the museum’s historic shipyard and two of the Kennebec’s famed lighthouses: Doubling Point Light and the Kennebec Range Lights. Running daily at 12 pm and 2 pm, May 18-October 27. * Members $30; nonmembers $37; 6-12 years $20; under 6 $6 *Saturday 2 pm cruises end on October 5.